This is my version of homemade Mallomars. But instead of painstakingly forming individual cookies, I use the bar cookie method, spreading everything in one large pan. 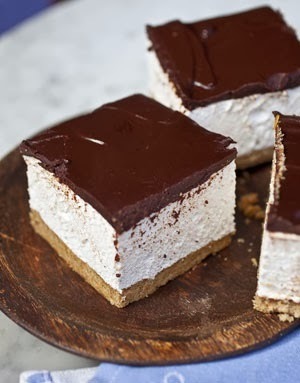 I end up with a crisp, homemade graham cracker crust topped by honey marshmallow and a thick layer of chocolate. Though they are easier than the original recipe, I wouldn’t call them a super-quick dessert. You still need to devote a good part of an afternoon to their confection. Or try to make the components over several days if it’s easier to carve that out of your schedule. However you manage it, the payoff is big: They are truly scrumptious, and I guarantee that if you bring them to a potluck or party, no one else will have brought anything remotely like them. They are unusual, crowd pleasing, fancy looking, and even slightly good for you (okay, just slightly) from the whole wheat flour. 1. First, make the graham cracker base. In the bowl of an electric mixer, cream the butter, sugars, and honey until smooth. In a medium bowl, combine the flours, salt, and cinnamon. Add the dry ingredients to the mixer and beat until the dough just comes together. 2.Wrap the dough in plastic and pat into a disc. Chill the dough for at least 1 hour and up to 2 days. 4. While the graham cracker base cools, prepare the honey marshmallow. Place the gelatin in the cold water to bloom. In a saucepan over medium heat, cook the sugar, honey, and 1/2 cup water, stirring until the sugar dissolves, until the mixture reaches 240°F on a candy thermometer. 5. In the bowl of an electric mixer, whisk the egg whites and salt until soft peaks form. When the sugar mixture has come up to temperature, carefully pour it into the egg whites while whisking. Continue whisking until the mixture has cooled slightly, about 1 minute, and add the gelatin and water mixture and the vanilla. Continue whisking until the mixture begins to thicken and quadruples in volume, 5 to 7 minutes. Scrape the marshmallow onto the graham cracker base and smooth the top with a spatula. Allow the marshmallow to set for 4 hours or overnight at room temperature. 6. To prepare the chocolate glaze, place the chocolate pieces in a bowl. In a saucepan over medium-high heat, bring the cream just to a boil. Pour the cream over the chocolate and whisk until the chocolate has melted and the glaze is smooth and shiny. Pour the glaze onto the set marshmallow and smooth with a spatula. Allow the glaze to set, about 30 minutes, before cutting into squares.